Here’s Day 3 of The Our Lady, Undoer of Knots Novena! Our financial condition to improve. My son and his family to get a visa to stay back in uk and work. My grand son to get a good job. My grand daughter to study well and get good marks. Peace and health to my children and their family. I have given all my headaches,anxiety,troubles to my God. Everything is in his timing. These novenas have given me so much more understanding , I have so much love for everyone. My prayers are being answered all in God’s timing. Thank you. I pray to you, my mother, undoer of knots, that all my prayers and intentions will be answered. I wish to live in your love and the love of the Holy Spirit. I trust in your divine intervention now and always. Mary I ask that you untie the negative and dark knots in my life. The knots of my broken heart. My deprived soul. My dire financial situation. My living situation as from tomorrow I have no home to live in. Untie the knots of all my sins that have kept me from being a healthier man. Holy Mother thank you for giving me the strength to go to Shipley today and for friends and company. Please give me strength for tomorrow. In the name of the father. Amen. 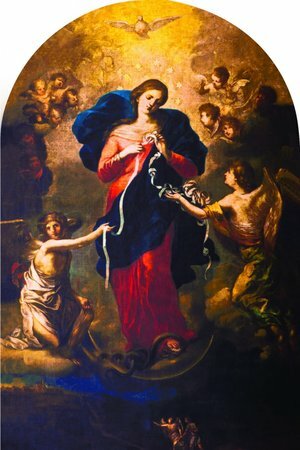 Mary, undoer of knots, please come to the aid of my husband who is undergoing cancer treatment. O Mother Mary, I have always had faith in you right from a little girl and most of the time my prayers have been answered. Thank you. Now again I ask your help in untying the following knots for me (1) peace in my family. Make my husband a better person, more loving and caring towards me and his family. (2) Bless my son and his wife. Help them with their finances. Let my son get a substitute for the contract that is expiring next month and help his little business improve. (3) My niece has left her husband, daughter and home for someone else. Enlighten her and guide her. (4) heal my brothes, sisters in law, who are ill. (5) let my husband and me grow spiritually. My son too and help him lean more towards the word of God, go to church regularly and receive Holy Communion and confession. Mary undoer of the knots I pray that my children come back to church they need guidance n help I offer them to you. Pls have my Aunty out from the oxygen she is on it since 7 weeks pls untie her knot in Jesus name. I pray to you for my business to pick up. Pls hear my prayers Mother Mary undoer of the knots. Praise and thank you always! I pray that I may become financially independent, free from all debts and able to provide assistance to others as they have provided for me. I pray for a spouse, knowing that I am called to marriage and family, may I meet and know my husband. I pray for open doors to this vocation I feel deeply called to, for the resources and wisdom to move forward. I pray for friendships for myself and for my family that we may once again be reunited with a community and family. I pray for my brother who just purchased a house and for my family that they may not have to sell their house. Praying for my brother Ed who is suffering with cancer and is in a trial program now for help also for my son Michael who had heart surgery in October that his heart continues to get stronger and his health will improve with time and prayers. For all my family members that are suffering with health issues . Thank you. ? Mother Mary, Hear my prayer of undoer of Knots… My plea for your intersession do undo with Bob and his constant hold on me. Set him free, grant him Mercy & Peace in his days. I pray that he does the right thing. Help him seek a job and his attention on what brings him peace and love. Our lady undoer of the knot, please remove the knot that is blocking my grand daughter Cianna in speaking and communicating. In her growth and brain development. Our lady undoer of the knot, please remove the knot surrounding my daughter and her family in concentrating in Catholic faith, as now they can not attend mass and give God much space together in their family. Our lady undoer of the knot, please remove the knot that block my spouse from his good health and happiness. Our lady undoer of the knot, please remove the knot that block many children of this world in their growth and the Dr claim that they are Autistic, help in praying to your Son Jesus Christ so that He fights the lies of evil and kick him out of the all the children said to be Autistic. Mary undoer of knots, pray for us and all who post their intentions in this webpage. Holy Mother, Please untie all the knots in my son’s applications to medical school and make it happen for acceptance in CAUSM and for him to start from fall and complete medical education on time. You help untieing the knots in this process. Take my prayers to Christ Jesus and make this happen today. Amen. Dear sweet Mary, please undo the knots of pain in my daughter , Sarah as she looks for healing and your precious light by using psychoactive drugs instead of her faith in prayer in your love for her. Please undo these knots in her of generational addiction and emotional pain and free her to find her life in Christ’s love for her. Keep her safe as she travels in Israel, please keep loving people of faith surrounding her, guiding her choices for right action. Please keep her safe from all harm and for all young people seeking peace through the use of drugs. Mother Mary thank you for all your past help! Please continue to intercede before your loving son Jesus for my daughter Dawn that her health will improve 100% and her 24/7 pain Jesus will take back so that here on earth she will be able to enjoy all of life’s blessings. Please let the injections in her right work to reduce or completely take back the pain she is enduring so that she will not need surgery. Please remove the knots that are blocking Dawn’s good health. Most gracious Mary Mother of Jesus please pray that I can get my Assistance renewed without problematic issues. My wife and I are desperate for this assistance. Oh Holy Mother our financial position at this point in time is dire and we need your help and prayers to get us through these troubled times. Help me to change my attitude within our family so that we all move forwards. Please help my wife and I mend the mistrust in our family, we need especially at this time of aging to live as a united family. Dearest Mother, Undoer of Knots, please pray for SRS that she will get custody of her 3 young children. She wants to raise them in the Catholic faith which her ex-husband is fighting even though he agreed when they married . He has turned into an evil, controlling, narcissistic man. Please defend her against the devil that is in their lives. Thank you! Please pray that my daughter will bring her family back to the Sacraments. Please pray that she will find gainful employment, her financial stress has been ongoing for a long time. Please pray that my son-in-law will receive complete healing for his eye and also that he will return to the faith. Please pray for a good outcome for a business issue we are having, and that we can rebuild our business. Lord Jesus I pray for your intercession.i pray blessed mother please remove the knots that is blocking the flow of my finances. I pray for money to finance my son throughout medical school and to meet his other needs. I pray that my son and daughters would be successful with their studies. Our Lady, please heal the relationship between my daughters. Open their hearts to forgiveness and tear down the walls that have been built up between them. Please Our lady help me to turn my son around so he takes his work seriously and refrains from telling lies at all times. Our lady please undo the knot in my marriage and bring my spouse back home so we live like the holy family lived. Our lady undoer of the knot, please remove the knot surrounding my brother and his immigration issues. Our lady undoer of the knot, please help me to move onto other things in life which will give me more personal time but with a good financial foundation. Our lady please vindicate me at work and in my marriage. Our lady I gave a loan out which was to be paid back in three weeks, it’s now four months, our lady please help me to retrieve my funds. Thank you Our lady for always being there.